Sew many requests for a simple tee shirt shirt. This one puts an elegant twist on one for you but will get you comfortable with all of the serging ins and outs before we tackle ribbed colors and double cover hems. This goes together quick and fabric choice makes a huge difference in your results whether you want plain or elegant. Bring your serger, power cord and foot pedal and 4 cones of serger thread in either white or taupe. 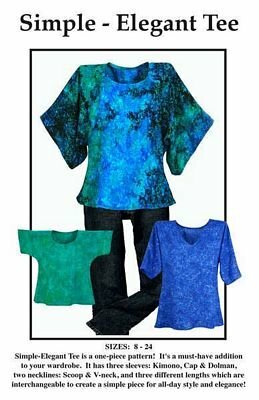 Cost of the class includes the pattern and a choice of your fabric kit for this "technique" class. You will leave with a completed tee.... with any luck, it will be one you will love or be able to gift. I'm pretty certain you'll be making many more of these in a variety of fabrics for casual summer outings or even elegant dinner parties. It's quick, versatile and comfortable.